Carpet Diem Iron designs, fabricates and installs ornamental ironworks for your railings, awnings, fencing, gates, window inserts, balcony rails and more. We specialize in custom iron fabrication for your home or business! We take pride in our craftsmanship and offer nothing less than top professional iron work. Family owned and operated, Carpe Diem Iron offers over 16 years of experience in the industrial project industry. We have focused our design specialties on delivering top-quality iron fabrications and ornamentals. 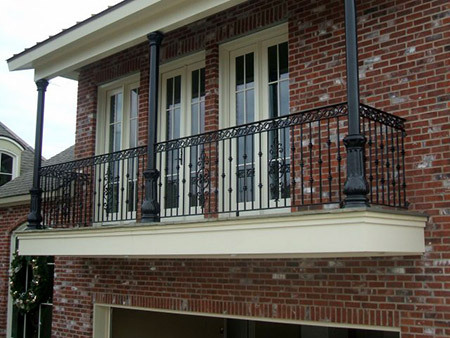 Our expertise includes the fabrication of beautiful wrought iron balcony railings, court yard railings, stair railings, belly rails, Orleans style post and more. Our custom work will make the fencing, awning, gates and windows of your home or business stand out with gorgeous ornamental wrought iron in Gonzales, LA. We are committed to exceeding expectations on every project, and we are positive you’ll be impressed with our detailed craftsmanship. We are locally owned and operated, with over 16 years of experience. We are proud members of the BBB. We offer free consultations, and stick to the price we quote you! We provide on-site measuring and expert custom installation, or you can submit your order for shipping. Contact the design experts at Carpe Diem Iron today for gorgeous ornamental work and industry-leading service. Se habla español.